Education Boutique 2006 is an event that took place between 29-Apr-2006 and 30-Apr-2006 in Hyderabad. Young Hyderabadis! Wake up and smell the coffee. Time to put your careers on track. The Education Boutique - 2006 at Taj Krishna, is a one-stop shop, tailored to meet the requirements of aspiring students, flustered parents and academicians in general. 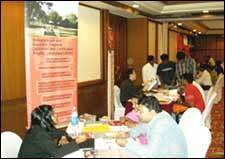 The fair offers professional career counselling for students. Seminars and workshops on educational institutes and career choices will also be held. Mock tests as well as on the spot admission in overseas universities are also available. The entry fee is Rs. 40. Please contact 98480-24076 for further details. Be the first to comment on Education Boutique 2006! Just use the simple form below. fullhyd.com has 700,000+ monthly visits. Tell Hyderabad what you feel about Education Boutique 2006!